The way people buy things is changing. PayPal can help your business adapt. Adding digital payment options to your checkout can be fairly easy; deciding which ones to accept may be a little harder. So how do you choose the right payment options for your business? Before you dive face-first into the digital payment comparison abyss, take a deep breath and think about your customers. Which payment methods are going to be the most convenient for them? While digital wallets like Apple Pay® or Samsung Pay® may be preferred by some, they only work for customers with a compatible device. Your goal should be to provide checkout options that are convenient for all your customers - no matter what kind of technology they use. You should also keep in mind that security is the primary concern for most customers, so it’s important to offer payment options that your customers trust. This can be especially true for new businesses where customers may be looking for added assurance that checkout is secure. Letting shoppers check out using a familiar payment method can give them added confidence when buying from your site. While putting your customers first can be the key to better conversions, don’t forget about the needs of your business. A payment option with complicated pricing can make record-keeping difficult – even worse, it could potentially hurt your bottom line. You should also consider what kind of technical support will be needed. If a payment method requires ongoing updates and you don’t have regular access to a website developer, that payment method may not be right for your business. At the end of the day, you want to offer online payment options that meet the needs of your customers and your business. That’s where PayPal Checkout comes in. 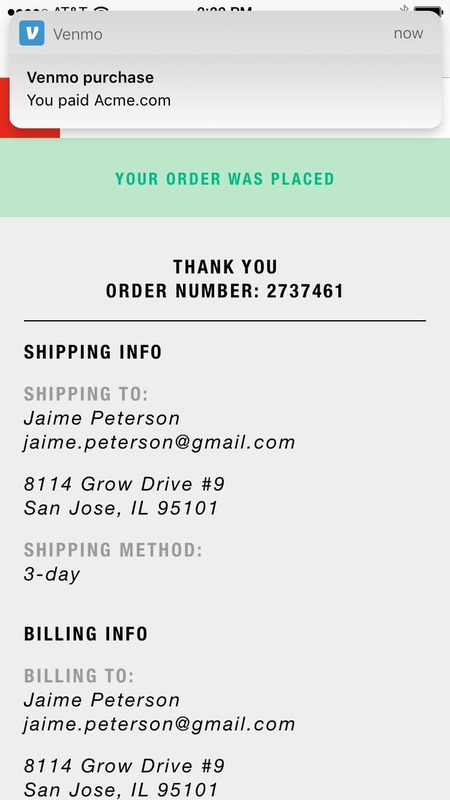 A versatile solution: PayPal Checkout. PayPal Checkout is a one-and-done payment solution that lets your business accept a range of payment types. With a single integration, your checkout will automatically show customers the most relevant payment options– whether it’s PayPal, Venmo2, PayPal Credit3, major credit and debit cards, or (coming soon) a local payment method. And no matter how someone chooses to pay using PayPal Checkout, they’ll be able to complete their payment without leaving your site. Help reach more millennial shoppers with Venmo. You probably know that Venmo is a quick and popular way to send money to friends who use Venmo, but did you know that it can also be used to make purchases? 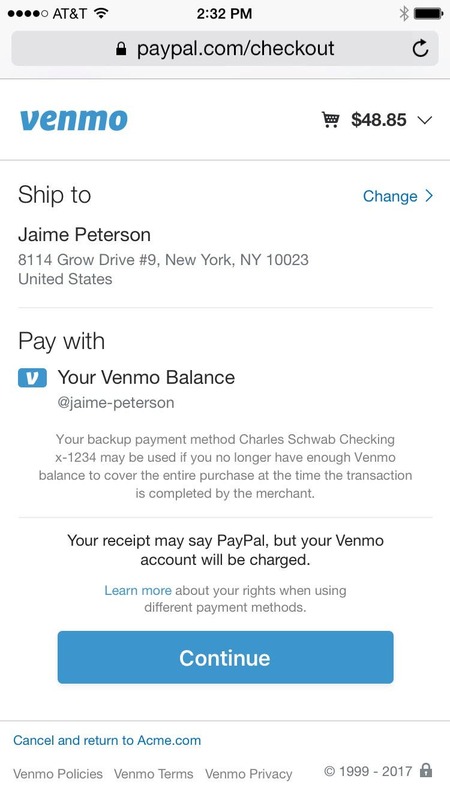 What sets Venmo apart from similar apps is its social appeal. Venmo has a social feed that lets users share a description of their purchase, either publicly or with friends. It’s like the memo line on a paper check, but with emojis. The social aspect of Venmo has been particularly appealing to millennials, some of whom may check the app just to see what their friends are up to – even when they’re not making a transaction. This means added exposure for your business whenever someone decides to share their purchase, giving you a potential in with this highly coveted demographic. Win-win. Give customers more buying power with PayPal Credit. With PayPal Credit, your customers have a chance to buy now and pay over time – all while you get paid upfront, with no consumer credit risk. This flexibility can help boost sales and increase average order sizes. It can also help your customers – especially when wallets are feeling tight. PayPal Credit gives your customers access to special financing for 6 months on purchases of $99 or more.4 It lets them get what want, when they want it – and spread out the payments over time. This can be helpful to your customers during the holiday season. They simply select the PayPal Credit option at checkout, enter a few pieces of information, accept the terms, and get a decision in seconds. Customers who get approved have instant access to a line of credit that they can use to complete their checkout on your site. Accept both credit and debit cards. Of course, not everyone has ditched their actual wallet and gone digital, so you should still accept credit and debit cards at checkout. 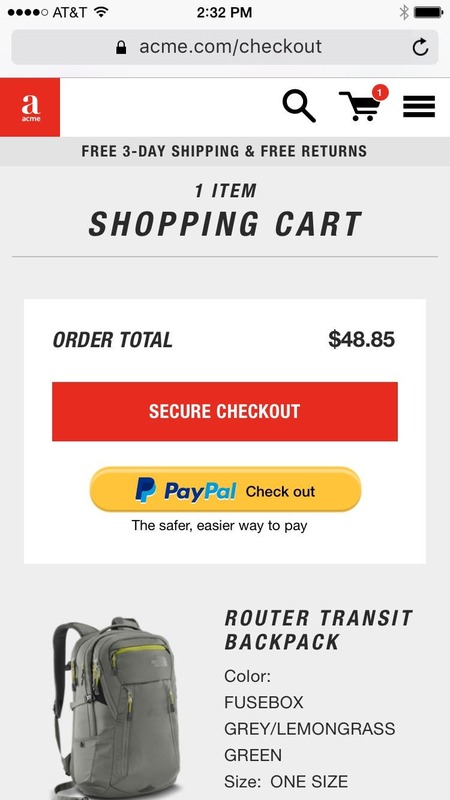 You may even have payment processing already in place for these transactions, but if you don’t, PayPal Checkout has you covered. Shoppers who would rather pay with a debit or credit card can use PayPal to check out as a guest – without ever leaving your site. You work hard to meet the evolving needs of your customers. Make sure you choose a payment option that works to meet the evolving needs of your business. 1 PayPal commissioned comScore online survey (of U.S. adults (aged 18+; n= 1172) who own and use a mobile device, and who have browsed or researched products or services online on any device in the prior 6 months. Jan-Mar 2018. 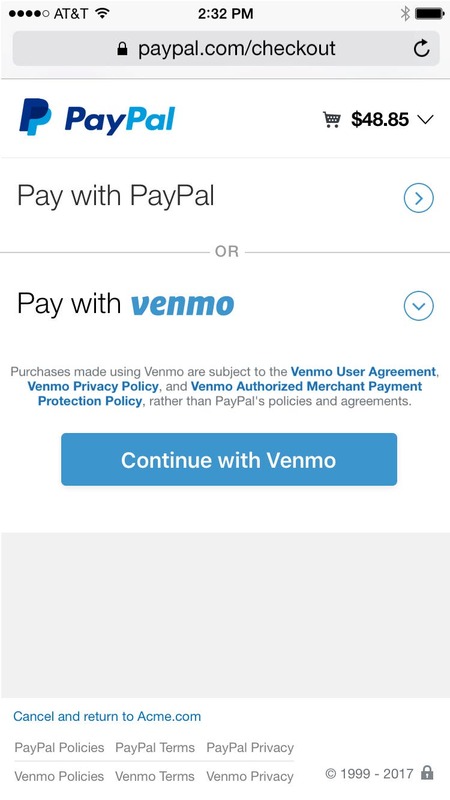 2The ability to accept Venmo as a payment option is currently available with mobile-web checkout only in the US, and only with eligible businesses. 3PayPal Credit is subject to consumer credit approval. 4 Customers check out with PayPal and use PayPal Credit. PayPal Credit is subject to consumer credit approval. 5Study commissioned by PayPal and conducted by comScore Research. comScore survey administered in Q3 2017 to over 2,100 U.S. adults who have made online purchases. 6As reported in Nielsen’s PayPal Credit Average Order Value Study for activity occurring from April 2015 to March 2016 (small merchants) and October 2015 to March 2016 (midsize merchants), which compared PayPal Credit transactions to credit and debit card transactions on websites that offer PayPal Credit as a payment option or within the PayPal Wallet. Nielsen measured 284890 transactions across 27 mid and small merchants. Copyright Nielsen 2016. 7 Source: comScore online panel, Q4 2017. Analyzed shopping behavior of 1 million US consumers on 20 large merchant sites. Checkout conversion is measured from the point where consumer selects a payment type to completion of purchase. What are the benefits of offering PayPal Credit on my website? PayPal Credit allows your customers to pay for their purchases without entering debit or credit card numbers, or sharing their personal data with you. It’s convenient and secure, and you still get paid right away. And best of all, PayPal Credit customers buy now and pay over time, or by choosing to take extra time on non-promotional purchases and paying a competitive interest rate. Good for you. Good for your customers. Offering PayPal Credit as a payment option is not only a benefit for your customers. It can help you boost sales as well as increase average order sizes, 21% of PayPal credit users say they spent more online because PayPal Credit was available1. PayPal also gives you free, ready-made banners that you can use to advertise the PayPal Credit special financing offer on your website. Adding the banners to your website is as easy as copying and pasting a few lines of code, and you can choose from several different sizes in our financing portal. When your customers finance purchases with PayPal Credit, you don't assume any credit risk or have to worry about billing customers and collecting their payments. So if a customer doesn't pay, there's no impact to your business or your account balance - PayPal won't deduct the amount from your account to cover the loss. And it's free to put banners on your website and in customer emails. Offering financing increases customers' buying power and encourages them to buy more. Let buyers pay over time for their purchases. Let customers know that you give them more choices, so they come back to shop again. Plus, the application process is easy for customers: They simply check out with PayPal and select the PayPal Credit payment option, enter a few pieces of information, accept the terms, and get a decision in seconds. 1 Study commissioned by PayPal and conducted by comScore Research. comScore survey administered in Q32017 to over 2,100 U.S. adults who have made online purchases in the past year. Specific questions may have been answered by a subset of the participants. 2 As reported in Nielsen's PayPal Credit Average Order Value Study for activity occurring from April 2015 to March 2016 (small merchants) and October 2015 to March 2016 (midsize merchants), which compared PayPal Credit transactions to credit and debit card transactions on websites that offer PayPal Credit as a payment option or within the PayPal Wallet. Nielsen measured 284,890 transactions across 27 mid and small merchants, Copyright Nielsen 2016. How do I check out with PayPal on Amazon? To use PayPal as a payment option on Amazon you can use your PayPal Cash Card or your PayPal Business Debit Mastercard. If you’d like a PayPal debit card and have a personal account you can request a PayPal Cash Card. If you have a business account you can apply for a PayPal Business Debit Mastercard. How do I view my PayPal Business Debit Mastercard transactions? Select PayPal Business Debit MasterCard on the left hand side of your PayPal account (directly under your balance). Your recent transaction history will be listed on the right side. Additional details regarding your Business Debit MasterCard transactions are available by selecting a particular transaction. You can also view details including a running balance by selecting the ‘completed’ option on the right side of the PayPal account. You can view the last month of debit card activity from your PayPal transaction Summary page. If you’d like to see all your PayPal payments, or more than the last month of activity, you can view those from your PayPal account Activity. You can also print your statements by selecting Reports at the top of the page, then click Statements on the left side of the page. It takes between 1-5 days for funds to move from your PayPal account to the merchant. The merchant uses the hold as an authorization as is the case when you check into a hotel. The merchant (typically gas stations) will send out a small funds inquiry to make sure that you have the funds available. Check back in a few days as the "Pending" status will likely change to either "expired” or “completed”. See expired and completed status definitions below. Placed - A temporary hold has been placed on the funds in your account for a purchase. This expires when the payment is completed. Completed - Your debit card purchase is completed. Debit Card Credit Received - This means the merchant has issued you a refund. The funds have credited to your PayPal balance. Expired – This appears 5 days after the authorization was initiated. If the merchant has not collected the funds the funds are released back into your PayPal balance. The authorization is still available for the merchant to capture the funds and complete the transaction. Canceled Transfer – This is found in the details of the expired authorization. The merchant did not collect the funds within 4 days. At this time, any money that was placed on hold is credited back to your PayPal account balance. The merchant can still collect those funds at any time. You can view the details of the purchase, including the purchase and settlement dates, by clicking on the transaction. Learn how to find the right payment solution for your business. 7 sources of small business funding you need to know about. Businesses often need financing to buy inventory, invest in equipment, expand operations, or smooth out uneven cash flow. In recent years, a number of new sources of small business funding have sprung up – so many, in fact, it's hard to keep track of all the options. Here, we'll discuss some of the more common small business financing options. For a fuller look, download our ebook, Financing options for small businesses. 11 ways to help speed up the collection of payments. Trouble with collecting payments, also known as delayed receivables, is a common challenge for business owners. When clients don’t pay for goods and services in a timely manner, your business may struggle. A lack of cash flow makes it difficult to pay employees, buy more inventory, and invest back into the business. When to create a mobile website for mobile commerce. With the skyrocketing popularity of smartphones and tablets, it only makes sense to create a mobile website for your business. Read this article to learn where to start, and how to start with mobile commerce.